Friday was a happy mail day for me! I opened the mailbox and found my new Rocksbox. Last month's was a really beautiful box. If you missed it, you can read it here! Any who, the last box was beautiful, but this box is drop dead stunning. This box is filled with dreamy hues of white and blue, which is totally my favorite color combo. I am already wearing my Kendra Scott earrings today and my Olivia & Grace ring! Here's my verdict on the pieces in this month's Rocksbox! 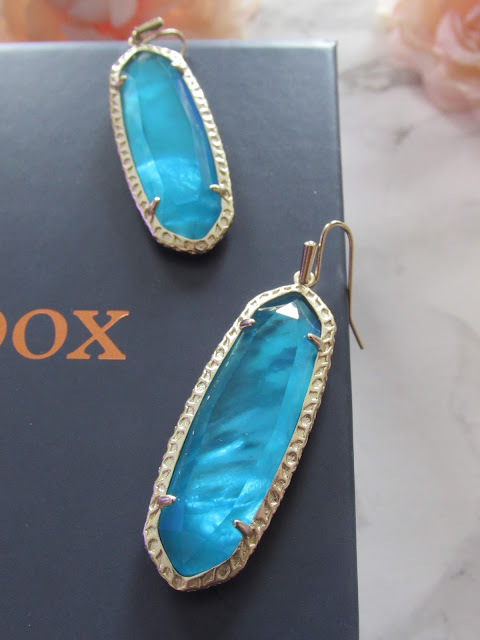 Kendra Scott Lauren Earrings in Blue Illusion // These earrings are too die for. They're a vibrant blue that are absolutely entrancing. Not only are they perfect for summertime, but they're just a perfect earring. I have so many pairs of Kendra earrings, but these are unique. The gold border around the stone has a small pattern in it. I love that! It's such a simple detail that makes a huge statement. 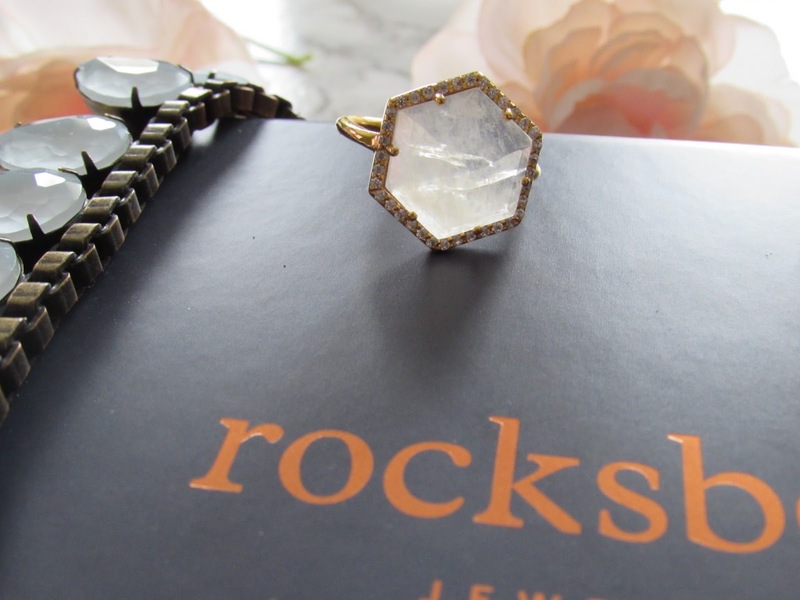 Olivia & Grace Hexagon Pave Ring in Moonstone // I saw this ring on Rocksbox's Pinterest and I knew I had to try it out! I love the color of the stone and the dainty little gems around the center. It's such a pretty cocktail ring that will be perfect with any outfit I pair it with. A neutral ring and a gorgeous one none the less! Only small issue, it turned my finger a little green. Not sure why, but it only did it once. Loren Hope Sylvia Necklace in Ice Blue // Y'all.. this necklace is so beyond pretty. I love the interesting shape of the stones and the color is so perfect for me. Not only is the necklace perfect for an everyday statement, its perfect for fancy events too. I totally plan on wearing it this weekend at the wedding I'm going to! It's so different from anything I have, so I totally want to keep it. All in all, this Rocksbox round was fantastic. I never want to send any of the pieces back! They really are so gorgeous and fit my style perfectly. 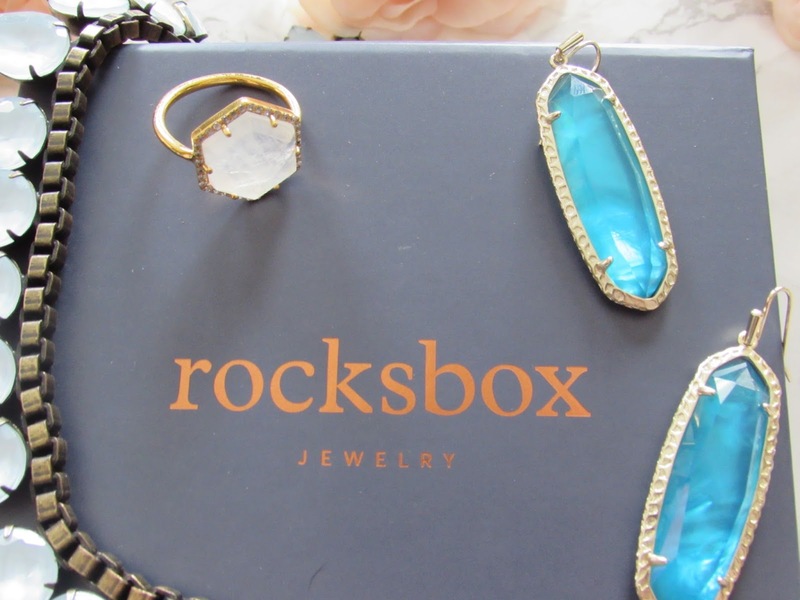 Bravo Rocksbox! Thank you! Don't forget, you can use my code chroniclinghomexoxo for a free Rocksbox! It's totally worth it!